Gay marriage, flatware etiquette, and Wendy Davis: The week's most interesting Slate stories. The Supreme Court struck down the Defense of Marriage Act last week. “Evolve With Me: Today’s gay marriage rulings are about amazing—and utterly rational—historical change,” by Nathaniel Frank. Frank traces the history of both gay marriage bans and popular support for marriage equality. Elsewhere in Slate John Dickerson considers the implications of recent SCOTUS decisions on the GOP’s agenda and William Saletan explains why being anti-gay is so yesterday. Read more from Slate’s coverage of gay marriage here. Elsewhere, Slate’s legal experts chewed on the rest of the meaty decisions the Supreme Court made this week. “Lone Star: Filibustering state Sen. Wendy Davis may have done the impossible: revived the Democratic Party in Texas,” by Christopher Hooks. Texas state Sen. Wendy Davis made headlines across the nation earlier this week when she filibustered “one of the most restrictive abortion bills in the country.” Hooks claims that Davis’s stand could help the state’s Democratic Party rally votes—and perhaps even land her in the governor’s mansion one day. “Born This Way? : Scientists may have found a biological basis for homosexuality. 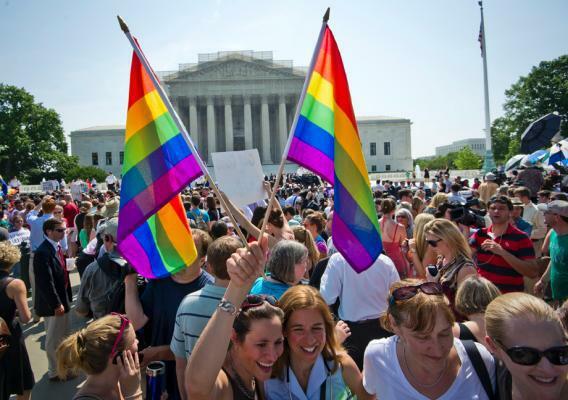 That could be bad news for gay rights,” by Mark Joseph Stern. The “fraternal birth order effect,” comes from studies that have shown that “men with older brothers are likelier to be gay than men with older sisters or no older siblings.” The problem? Some hypotheses behind the fraternal birth order effect suggest that “homosexuality is seen as a disorder,” a view that Stern says we must abandon. “The Court Got Baby Veronica Wrong: Here’s why it should matter to you, Indian or not,” by Marcia Zug. The court’s decision earlier this week sent this highly publicized case back to the South Carolina family court. Zug takes the majority argument to task, labeling it “an ode to the virtues of adoption” and criticizing the justices’ central concern—that ICWA will act as a deterrent to the adoption of Indian children (“duh, that’s the point!”). “The Darko Ages: How magical thinking and racism produced the NBA’s most notorious draft bust,” by Jack Hamilton. Hamilton explains how Darko Milicic’s recruitment exemplifies the “Euro-prodigy” craze in American professional basketball. This fad, however, was spurred less by the Europeans’ talent than by the racism of NBA officials, who wanted a “great white hope” to save American basketball from deterioration. “A House Divided: Why the students at one prominent South African university, once a model of racial harmony, chose to resegregate,” by Eve Fairbanks. The University of the Free State, located in central South Africa, astounded administrators when it first decided to integrate. The first black students who attended melded well (or so it seemed) with the campus culture and traditions. As the black student population began to increase, however, the latent tensions present since the beginning of integration caused the school to resegregate. In this fascinating and devastating story, Fairbanks proves wrong the notion that social progress is inevitable. “Put a Fork in It: The American way of using fork and knife is inefficient and inelegant. We need a new way,” by Mark Vanhoenacker. If you’re American, chances are your fork does a lot of moving around during dinner time. The “cut-and-switch” method describes how diner move their fork from the left to the right hand after cutting their food. This uniquely American phenomenon actually has its origins in European etiquette, but Americans are the only one who still live by it. Vanhoenacker says we should ditch our individuality for a real American ideal: efficiency in eating.